Once a dusty intersection with some abandoned buildings, parking lots, and a few market stalls, Anděl has become the hub of activity for the Smíchov district. Since the early ’90s, its development has refused to abate. DESPITE Smíchov’s industrial character as it emerged from Communism, including a functioning brewery and railway station, its proximity to the center, transportation connections and border with Malá Strana, including a very green hillside, began to prevail. The municipality of Prague 5 supported the area’s redevelopment, referring to it as “The New Face of Anděl”. But it was the developers that bore most of the early risk, seeing in the area great potential. ING, UBM, Carrefour, and Karimpol were the prime shakers. ING’s Zlatý Anděl was the first office building completed, followed by Carrefour’s Nový Smíchov. The largest of the projects, still going up in phases on a 25,000 m2 plot of land nearby is UBM’s Anděl City. According to UBM director Margund Schuh, office space has leased easily, attracting companies such as Pfizer in the project’s second phase and Cetelem in the current third phase. 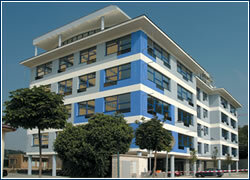 The company also expects similar success for the project’s residential components. Karimpol’s Martin Prokeš agrees. “We had no trouble at all leasing virtually all of the space in Anděl Park,” he claims. “It’s the best area we’ve ever had a project in. Demand for Smíchov is enormous still.” Among Anděl Park’s major tenants are Johnson & Johnson, Mafra, and CAC Leasing. Immoconsult’s Smíchov Gate, launched this month, is a sign of similar confidence. “There’s about 100,000 m2 of office space finished or to finish in Smíchov proper, slightly more if you include neighboring areas, with 40,000 m2 of this completed in the last two years,” says Cory Hrnčiřík, head of research at CBRE. “It’s been developer-led, a case of ‘if you build it they will come’. Total vacancy in the district is under five percent, one of the lowest rates in the entire city,” he adds. The municipality of Prague 5 has also been careful not to repeat mistakes made in the west, notes Hanečák. “They don’t want to make it strictly a business locale, so they’ve made sure that there is a certain amount of residential development to keep it lively not only in the day, but in the evening,” he says. “Smíchov’s come a long way since Mövenpick opened its doors, and it’s not over yet.”. The growing business/industrial area near the river in Modřany is host to several developments, among them, the freshly completed building DVAN, by 2N Communications. THE BUILDING offers 2,420 m2 of space, with an architecture and location that predetermines it for a broader use than mere offices. “It was the idea from the design stage to create office space for a group of companies oriented the same way, for example telecommunications,” says Tomáš Fencl, leasing agent at Colliers. “It was made in accordance with regulations for light industrial use as well; such as floor weight, lift strength, and door and corridors widths,” he adds. That means, among other things, 500 kg-per-m2 load-bearing capacity per floor, vibration resistance, guaranteed three-meter ceiling heights even after soffits, as well as full access for disabled persons, air conditioning, ISDN and 32 MB internet connection. Reception is provided as required, and the top floor offers both a dining hall and a 160-person training/presentation hall. Views of the area’s foliage-laden hillsides and over to the river are good from many floors, but especially so from a glazed terrace on the rooftop. Parking for 63 cars is provided. The building is not far from the Barrandov bridge; links to the main city arteries and connections out of the city are good. The building is about 15 minutes from the city center by tram or bus. »An assistant to the senior partner of a company of chartered surveyors at age 18, where I stayed for six years while qualifying on a part-time degree course. What made you consider Prague as a new place to live? »I was offered a job to set up Ryden in September 1991. Did you imagine 15 years ago that you would be doing business in Prague? »No, but I would have said yes if the question had been 14 years. What do you most like in the business? »Many things, but probably the satisfaction from both an aesthetic and commercial perspective on completion of a development. What do you least like? What is the most difficult deal or project you have ever worked on? »They all are! 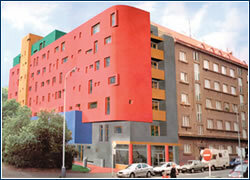 But especially Opera Center, in Bucharest – trying to build an institutional building for PwC and ING in 1999. “Limited funding”, very few contractors, Romania! What do you think will be the next place/area/segment to develop in Prague? »From what I see, nearly every district is set to be the new development area: Karlín, Holešovice,Smíchov, etc. Would you describe yourself as a workaholic? »No, more like an alcoholic. What is your favourite restaurant? »In Prague, probably Kampa Park, with a river view. What do you think most people don’t know about you? »That I am President of the “Miserable Yorkshiremans’ Association” in Prague.